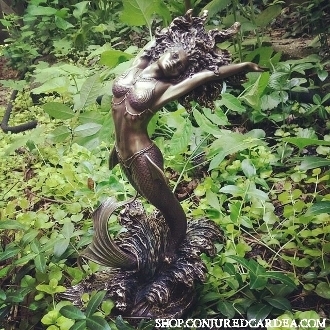 This is a STUNNING cold-cast bronze Yemaya statue with AMAZING detail!!! She is 12 inches tall and is incredible beautiful! Yemaya is a West African creation goddess, often depicted as a mermaid. She is associated with the moon, the ocean and female mysteries. Typically portrayed as a beautiful woman, Yemaya governs the household and intervenes in women's affairs. She is a merciful goddess, invoked by women for aid in childbirth, love and healing. She rules over the conception and birth of children and ensures their safety during childhood. As a creation goddess, Yemaya's womb spilled forth the fourteen Yoruba goddesses and gods, and the breaking of her uterine waters caused a great flood, which created the oceans. From her body the first human woman and man, who became the parents of all mortal beings on earth, were born. Yemaya nurtures, heals, touches, blesses, comforts and make whole that which is incomplete. She am within you and you need only look inside yourself to find her eternal presence. This is a stunning representation of Yemaya.